Separates pads smoothly and easily. Carbon steel blade with solid wood handle. Smoothly fits between pads to separating them for easy stacking, moving, production, and more. The Lassco Wizer W174 Pad Separating Knife easily and quickly separates pads for convenient use in your padding press. Made with a carbon steel blade and a wood handle, the W174 pad separating knife smoothly fits between pads to separating them for easy stacking, moving, production, and more. 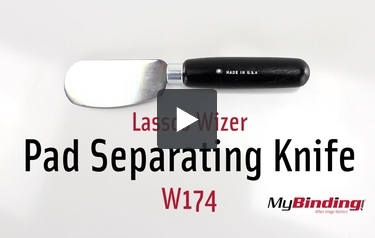 Check out the Lassco Wizer W174 Pad Separating Knife on MyBinding.com today and save. We use these knives everyday to cut pads apart. The ones we had were several years old and filthy. These new knifes are good quality and will make our job easier. Should have bought them years ago! If you think you can substitute just ay old knife to complete the task of pad separating, you are mistaken. This is a tool you need. This pad separating knife easily sliced my pads apart without damaging the paper. So glad I bought it. If you think you can substitute just any old knife to complete the task of pad separating, you are mistaken. This is a tool you need. This pad separating knife easily sliced my pads apart without damaging the paper. So glad I bought it. Owner Review by Pamela S.
This tool is very easy to use. Comfortable handle. Works perfectly! Review by Shannon D.
Product does exactly as it is intended. Can't do the job without it! Transcript: This is the Lasso Wizer Pad Separating Knife! After you glue your pads, and they dry for the proper amount of time, and you remove the project from the padding press, now you are ready to separate the large stack of pads for individual use. So, slip the knife under your chipboard, or wherever you want, and slide it partially across to cut the glue. I found that for best results, finish off the separation by pulling the pad off—this is in fact what the pads are made to do. Do this to all the pads. This is the Lasso Wizer Pad Separating Knife! On the few times I tried to use the knife across the entire length, I ended up cutting into the pages, ruining the entire pad below the one I was cutting off. So don’t do it—or do if it actually works for you, but be warned! But now you have your own custom made notepads!